How can you keep students safe in the science lab? From safety showers to eye wash stations, we can help you take the necessary precautions to ensure that your students are properly protected. With the right lab safety measures, you can ensure that every experiment is a safe one. When students see that a laboratory is properly equipped, they will come to understand the paramount importance of lab safety rules. An emergency shower and eyewash protects students, just in case they need it. 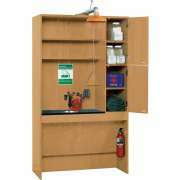 Contact Hertz Furniture to find out how you can keep your science classroom as safe as possible. Why do you need a safety shower in the school science lab? Any laboratory where chemicals are being used must have a safety shower. Emergency showers are specially designed for easy use at a moment&apos;s notice. They are located inside the science lab, so they can be accessed immediately. In the event that someone accidentally spills chemicals, they can quickly run over and pull down the handle for an instant shower. 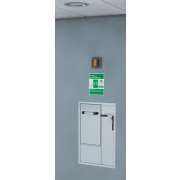 What kinds of safety showers can I get for the lab? 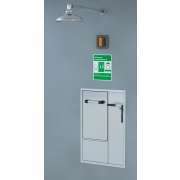 We offer emergency showers from Diversified Woodcrafts and Guardian Equipment. 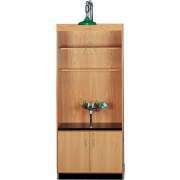 Diversified Woodcrafts models include extra cabinets as well as eyewash stations. These all-in-one units can also be ordered in a wheelchair-accessible configuration. With everything in one place, it will be easy for students to remember where to go and what to do in case of an accidental spill or splatter. 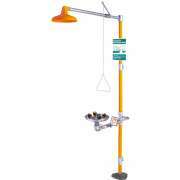 Guardian Equipment has a wide selection of safety showers. You can choose freestanding or recessed units which include built-in eyewash stations. Don&apos;t worry about using up the precious space in your lab with so much equipment. If you want to save space, recessed units are an excellent choice. 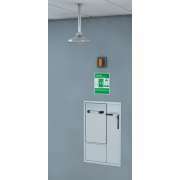 They utilize unused areas of your wall and ceiling, while offering easy activation. 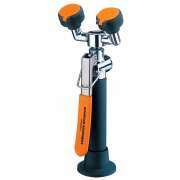 How does an eyewash station work? Eye wash stations are available in a choice of configurations. 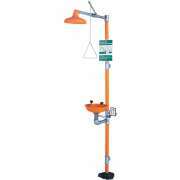 They come as freestanding units, attached to a lab shower, counter-mounted or faucet-mounted. Faucet-mounted units can be attached to lab sinks. Emergency eyewashes include two valves which aim water at the eyes to clean them out as accurately and quickly as possible. They generally need to be hooked up to some kind of water source such as a faucet or lab shower. Hertz Furniture has the safety showers and eye wash stations you need to ensure that your students are properly protected. Call us for a free personalized consult, which is catered to your unique needs. Our Project Solutions team will help you identify the necessary and optimal choice for your space and needs. Students, teachers, parents and administrators will benefit from the peace of mind offered by a properly-equipped, safe science lab.